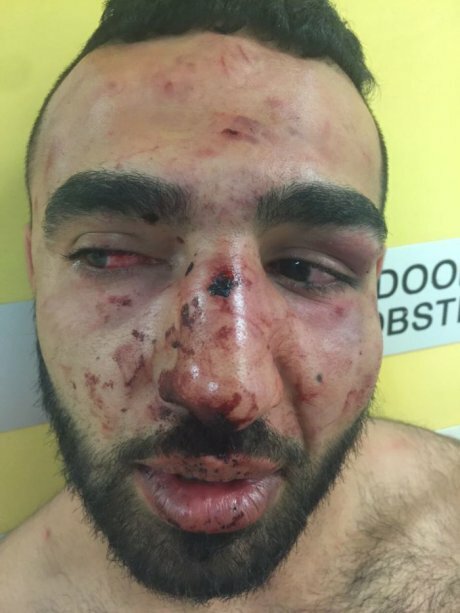 The family of a south-western Sydney man have alleged police "brutally bashed" their son outside their home and wrongfully accused him of assaulting police, resisting arrest and being in a police pursuit. Police allege 23-year-old plumber Omar El Baba was the driver of a car involved in a police chase on May 28 at 10:44pm, an accusation El Baba denies. According to police, a few hours later that night officers from Green Valley Police Station found the same car they believed to be involved in the pursuit outside a home on St Johns Road in Heckenberg with El Baba and a woman sitting inside. They said El Baba failed to produce his licence, became violent and assaulted police. He was then arrested and taken to Green Valley Police Station before being released to Liverpool Hospital for treatment for what police said were "minor injuries". El Baba's lawyer also claimed his client was only charged when a complaint was made later that day after he was discharged from hospital. El Baba was charged with assaulting police, resisting arrest and custody of a knife in a public place. But he gives a different version of events and denies he was involved in the police pursuit, saying he was out with friends that night. "My friend came over, picked me up, went to Bankstown to go grab a feed," El Baba said. He said later that night he was in his car outside of his house on St Johns Road when one police officer told him to get his licence otherwise he would be detained. "I got scared and told him 'I live here, I'm going to go get my licence'." El Baba alleged when he came outside with his licence, there were over 20 police officers including officers from the riot squad. "I told them they're not allowed [inside the house] because I felt scared," he told the ABC. "Then they all just rushed in and attacked me." He claims the police did not say he was under arrest or tell him they intended to take him to the police station. "They slammed me on the floor then they started kicking me, punching me, kicking my groin area," El Baba said. He told the ABC the police said repeatedly: "You 'effing' Lebo, that's what you deserve". "I thought they were hitting to kill me because they would not stop." "I was on the floor in front of my family getting stomped on, getting stomped on, and kicked in my face like a soccer ball." El Baba's sister Mona said she heard her brother's screams for help and ran outside to see "the most brutal excessive force I have ever witness in my entire life". "I saw police officers everywhere, punching my brother, kicking him, kneeing him, elbowing him on his head, his neck, his back," Ms El Baba told the ABC. "I could see my brother's face was absolutely horrific, he was bleeding, and it was just blood everywhere." Ms Baba is also a lawyer and told the ABC she pleaded with officers to stop attacking her brother. "I kept screaming out for them to stop using unreasonable force, I kept stating to them he was not resisting," she said. "They were going to eventually kill him if they keep going. "They showed no mercy, they were absolutely ruthless." El Baba's father Salah said he thought the police were going to break his son's back. "He [the police] want to break his back, I said 'you will kill him', he don't care," he said. "He hit him in the back 'bang, bang, bang' in the face, in the head. "The human being is not animal. If you're an animal, they never hit you like this." New South Wales Police declined an interview with the ABC and said the case was before the courts. Justice and Police Minister Troy Grant's office also told the ABC it would be "inappropriate" to comment on the matter before the courts and that the case was "primarily a police operational issue". A Liverpool Hospital emergency discharge sheet for El Baba, obtained by the ABC, stated on May 29 there was "pain and swelling on his face and head, nose and jaw, tenderness on his ribs and soft tissue swelling". Depends on if he was is the chase or not, he doesn't sound too innocent based on the places I'd say he was hooning and got caught then ran from the police, they found him with his car. but apart from that yeah the police will bash ya if you run from them and don't show license and then charge you for assaulting police, it's funny one of my friends got the assaulting police charge and he was only like 19 and he's still scrawny and only like 5'6'' pretty similar story did something wrong ran from them they caught up with him later that night, because he had ran once what is 'reasonable' force is significantly higher. He was innocent, read the rest of the link. the on board computer now tells then it spotted a wanted vehicle. 1984 had no idea how advanced tech could be. I don't think it was right he was beaten like that if he was innocent but, I also don't believe he wasn't in some kind of trouble. What's interesting to me in some of these stories lately, is that people on here seems to pick and choose when they think the police are right. and no one got shot, he went to hospital not the morgue. veya_victaous wrote: Depends on if he was is the chase or not, he doesn't sound too innocent based on the places I'd say he was hooning and got caught then ran from the police, they found him with his car. Interesting. I've asked before if the people who get beaten up/shot by police are the ones who tend to run away or resist in some way. That's why I say that I would stand completely still and not say a word until I was a police cell with a lawyer. HALF of the crimes in Sydney these days seem to be caused by those straying Lebo' dogs !!! THEIR owners should be neutering more of them while they're still puppies..
REDUCE a lot of that indiscriminate breeding ! is this now the term of "violently assault"
in an effort to refute the possibility that such vile manifestations of hatred couldnt possibly be found in "paradise"
I was only commenting on the op. darknessss wrote: brutally bashing ...huh?? ?